A 10-minute walk from Big C and Lotus shopping centers, Fairtex Hostel is in the lively Pattaya City. 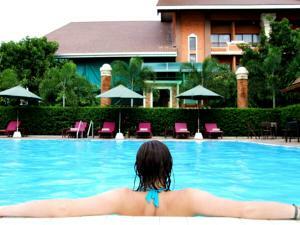 It features a Muay Thai arena, spa and rooms with a cable TV. Guest rooms at Fairtex come with modern interiors and warm lighting. All rooms are equipped with a refrigerator and private bathroom with hot shower facilities. Hostel Fairtex offers a range of fitness facilities that include tennis and racquetball courts. Guests can also work out at the gym or play a game of pool. Travel arrangements can be made at the tour desk. The restaurant serves a variety of local and international dishes. Room service is available upon request. The Fairtex offers free parking, and is half a mile from the center of Pattaya. Pattaya Walking Street is a 15-minute drive from the hotel. Wi-Fi is available in all areas and costs THB 180 per hour. Children older than 11 years are welcome. One child or adult is charged THB 700 per person per night in an extra bed. The maximum number of extra beds in a room is 1. There is no capacity for cots in the room. Any type of extra bed or crib is upon request and needs to be confirmed by management. Additional fees are not calculated automatically in the total cost and will have to be paid for separately during your stay.